Early in his Congressional career, Paul D. Ryan, the Wisconsin representative and presumptive Republican vice-presidential nominee, would give out copies of Ayn Rand’s book “Atlas Shrugged” as Christmas presents. He described the novelist of heroic capitalism as “the reason I got into public service.” But what would Rand think of Mr. Ryan? While Rand, an atheist, did enjoy a good Christmas celebration for its cheerful commercialism, she would have scoffed at the idea of public service. And though Mr. Ryan’s advocacy of steep cuts in government spending would have pleased her, she would have vehemently opposed his social conservatism and hawkish foreign policy. She would have denounced Mr. Ryan as she denounced Ronald Reagan, for trying “to take us back to the Middle Ages, via the unconstitutional union of religion and politics.” …. Jennifer Burns, “Atlas Spurned“, New York Times, 15 August 2012. 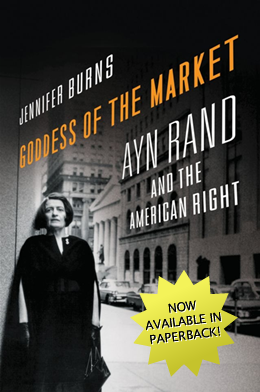 Stanford historian Jennifer Burns is author of Goddess of the Market: Ayn Rand and the American Right (Oxford University Press, 2009), an intellectual biography based on exclusive access to Rand’s unedited letters and journals. This entry was posted on Wednesday, August 15th, 2012 at 15:56	and is filed under History. You can follow any responses to this entry through the RSS 2.0 feed. Both comments and pings are currently closed.